In a moment of self-importance, I thought it might be fun to start blogging. 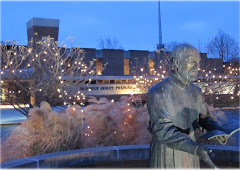 Based on conversations and experiences at Brebeuf Jesuit Preparatory School, posts center on my life as a Jesuit administrator/edtech in a 1:1 BYOT environment. Older posts are from my adventures in certification with the NETS via PBS Teacherline/ISTE... recycle/reuse. Look, I know that we have done this dance so many times over the last year. When I heard about you, I thought you would be the answer to my fondest wishes. Slim, functional, ready to replace once and for all the many utilitarian zealots who had come before you with their obsessive need to be productive and only support me in my work. And when you and I finally met, I will admit, you were very pretty - sleek yet subtle; urbane yet simple. And while we did not hook up right away, I kept my eye on you. Frankly, there was a period of time where you were the measuring stick for everyone else who came along. Now, in just a short period of time, you have transformed yourself. Well…sort of. But I have to admit, as much as you have changed, you just aren’t the one for me, but I think I owe it to you to let you know why. Let me start with the positive. I am SO happy for you that you have decided to open up your eyes and see the world around you. Frankly, I couldn’t understand why you were so blind from the beginning. And the fact that now you see the world in all directions is a delight to behold. But honestly, I don’t have to look very far to find others who do that and they have better eyesight than you. Also, when I see myself, or anything else, in your face you have the same dogged view you have always had; maybe you are jealous of your cousin with her bright resolution and clear retina. And I also feel like there can be nothing but good news with you being willing to talk to other people, but isn’t it a little rude that you will only allow yourself a little facetime with your friends and family? There are lots of people who might want to get together with us and it seems a little closed off for you to only want your smile to go as far as your clique. Maybe that is my issue. Maybe it’s my hang-up. I know that you keep telling me how much thinner you are, but I don’t care about that! It’s what is inside that counts and more importantly for me it is how you play with others. I don’t want to shop in the same shops every day. I don’t want to only see the movies that you choose. . I don’t want to be limited to the music you discover. I want to be able to be more open. And yes, if someone sends me a link with a flash of inspiration, I want to be able to see it and discuss it without having to sneak out to have that conversation with someone, anyone who is more open than you are. You can certainly keep up with me, especially after all the work you have had done. But the fact that your memory is tied to how much money I put into you is a little offensive. And you are so one-track minded. Sometimes I like to do a couple of different things at once. With you I feel like I am constantly starting over. Also, you can be a little thin-skinned. Face it, the world can be a little cruel sometimes and you shouldn’t be able to crack at the drop of a hat. I know that your new wardrobe makes you more polished and refined, but a little gorilla in your backbone would go a long way to you being able to take a few well-placed blows. I guess this is it. You are the right shape (although a little larger than I normally go for, but I know that is not your fault. You are the way you are made). But you only seem to work on those parts of yourself that everyone else already takes for granted. And you seem unable, nay unwilling, to fix the flaws that drive me absolutely batty. I would like to work this out, but try to discuss these things with you, and either you switch between one set point of view or simply refuse to make any sound whatsoever…and you know this is nothing new! I know that you’ll find someone else; indeed millions of people are lining up to be with you. But my heart must find another. One who compliments me in both my work and my play. One who can function normally without being tied to her computer day after day. One who can be held gently in one hand and conveniently allow herself to be carried without feeling like extra baggage. …and a stylus would be nice.